“7 Reasons to Replace Your Plug-ins with An Essential Oil Diffuser"
Just because it smells nice doesn’t mean it’s good for you. No one wants a foul-smelling home or office. It’s no surprise that air fresheners and wall plug-ins have become so popular. It’s very easy to just spray that can around the room, or just plug something into your outlet and forget about it. Did you know that you might be releasing harmful toxins into your home? You could be contaminating the very air you and your family is breathing, without even realizing it. Plug-ins seem like a good idea on the surface, but there are better alternatives you may want to consider in your home and office. A high quality essential oil diffuser will allow you the same great smell, with other aromatherapy benefits. Let’s take a look at why you may want to replace those plug-ins today. 1. 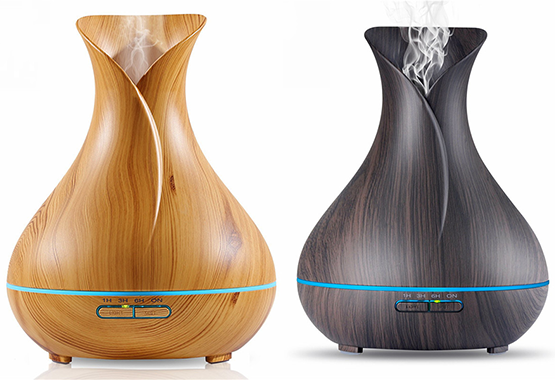 The scent lasts longer – The scent from an aromatherapy diffuser is designed to last longer. Your plugins usually say they will last 30 days, but most often the scent fades after the first few days. Plus, they easily get clogged and since they are disposable, there’s no good way to clean them. 2. It doesn’t contain harmful toxins – As mentioned above, plugins that you buy from the store contain chemicals and they will release harmful toxins into the air your family breathes. Just because it smells good, doesn’t mean it’s good for you. 3. It doesn’t just mask odors – The scent from an aromatherapy diffuser will do more than just mask an odor. They will actually help remove the odor from your home. When using the diffuser to get rid of bad smells, you should choose different essential oils, such as lemon or tea tree oil. Then you can diffuse another scent just for the aroma, if you choose. 4. You can experience health benefits – Because an aromatherapy diffuser allows you to diffuse essential oils, many people experience health benefits such as calming of anxiety, boosting of the immune system, or more mental clarity. You won’t get this from a scented plugin that is meant only to temporarily scent the area. 5. It’s a safer alternative – It’s not only safer because it doesn’t have harmful toxins, but also because plugins have been known to cause sparks, fires, or other electrical issues, especially when plugged in and not properly maintained. 6. It saves you money – In the long run, essential oil diffusers are more cost-effective. You can reuse the diffuser again and again, and only need to replace the oils. Since they use only a couple of drops of oils at a time, they will last a long time. You can also count the money that you will save on doctor’s visits and cough and cold medicines, if you find they give you health benefits, as many people do. 7. It repels insects and other pests – Can you believe that they can also keep bugs and insects away? If you have flies, ants, beetles, and other insects getting into your home or office, an aromatherapy diffuser can be a safe, natural way to deter them. You’re not going to get that from a cheap wall plugin! This state-of-the-art humidifier does so much more than just make the air around you smell good. It actually purifies the air you breathe, increases the air quality of the room you place it in. It does all of this while also emitting a pleasant aroma of your choice. You can choose different scents based on the aromatherapy outcome you desire. There’s no need to remove one plugin and replace with another and you’re not stuck with the same scent for 30+ days. This stylish, faux-wood, plug-in diffuser from our partner contains a large 400ml (13.5256 oz) water tank, making it a great choice if you are looking to run the diffuser overnight. 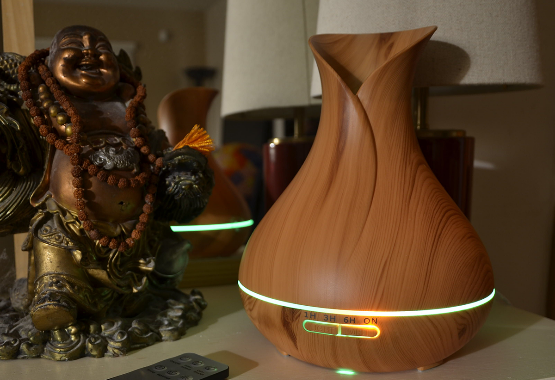 This diffuser comes with an LED color band on the base as well as at the top inside. 7 LED colors are supported and can be set to a specific color, automatic cycling or turned off completely. Can run for up to 12 hours at a time. Automatically shuts off when water runs out. Ultrasonic, which also means ultra quiet. Works great with both scented & essential oils. *We'll ship out the proper plug type based on your country of order. © Copyrights. Toasty Tech Corp. All right reserved.